Hummel's Sonatina for Trumpet, which bears some striking thematic resemblances to the Trumpet Concerto in E-flat by Johann Nepomuk Hummel (1778-1837) is a beautifully crafted work in neo-classic style, incorporating free use of dissonance (especially sevenths) but clearly preserving tonal centers. The first movement, "Bewegt" ("With movement"), in sonata-allegro form, features a much more extensive thematic exposition and development than is normally the case in a sonatina. Like Kennan, Hummel formulates themes sufficiently characteristic and loaded with musical possibilities as to maximize the effective use of such compositional devices as inversion, sequences, and changing combinations of various thematic ideas. The second movement, "Langsame Achtel" ("Slow eighth-notes") is a song-like ABA form with the trumpet in both lyric and dramatic roles. Immediately with the initial statement of the opening trumpet theme, the piano has the same theme in diminution (reduced note-values). This figure, with various changes in details of rhythm and pitch, and a recurring cadential formula form the piano part of the skilfully constructed movement. The final movement, "Rondo; ziemlich lebhaft" ("Rather lively") features a typically jocular rondo theme, and displays numerous relationships to the material and construction of the first movement. Each of the themes undergoes some development, ending with a fugal treatment of the opening theme. The rhythmic element again assumes great importance with the initial establishment of the motoric pulse, and the subsequent contrasting use of strong cross-rhythms and irregular metric patterns. 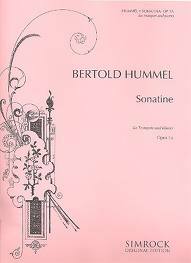 Sonatine for Trumpet and Piano by Bertold Hummel, is a three movement work which has strong harmonic ties to Paul Hindemith. This Trumpet sonatine is written for on the C trumpet. It is a wonderfully crafted work with melodic ideas that are well developed within each movement. The perfomer will also discover that Hummel specifically notates all articulations and/or dynamics in each measure throughout the piece. This is a seldom performed, 20th century work, which is accessible for an advanced student interested in programming a comtemporary piece for the C trumpet.